The visionary evangelical zeal of Steve Jobs lured me from my cozy philosophical pursuits at Barry University in south Florida to the frenetic gyrations of 1980s Silicon Valley. Jobs' incantations held me spellbound with his revelation of an Information Revolution that would not only democratize the entire world, but would inevitably and infallibly take a bite out of every apple that stood in the way of humanity's own paradise. iPads that take dictation! Location-based services that guide you to the nearest Italian restaurant! And soon, we are promised, human-computer interfaces that respond to your needs even before you speak, tap, or click. With all this going on it would only be natural to expect that the priesthood of the high-tech self-proclaimed digital Mecca of Silicon Valley would surely devise a host of dazzling techno-wizardries to conquer whatever ills are ailing America, all the way from here to Eternity. To question the omnipotence of Her Highness Technology or her saving graces would be a matter of heresy against new age orthodoxy. Even so, I am willing to stick my neck out and risk excommunication from Techno-Paradise and do just that. Why not? So, not discounting the remarkable accomplishments of the past hundred years, there are some nagging developments that would seem to signal that we are approaching some kind of tipping point—where three steps forward over here are confounded by three steps backward over there. Have a look, now, at some social, economic and political illustrations where even the most glittering technologies failed to deliver the expected end results. Jobs Crisis or Jobs' Crisis? Her Highness Technology has been performing more and more of the work that we used to do. This was once the chief selling point for the industrial revolution: washer plus dryer equals more leisure time for everyone. But now our labor-saving fantasies are turning into a daily nightmare for millions of lately obsoleted workers. In China, they're even replacing—note "replacing," not helping—waiters with robots. 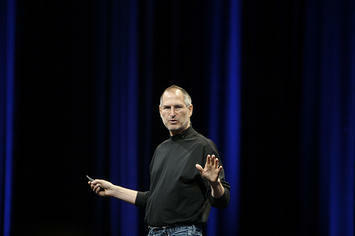 Can it be that Steve Jobs' revolution is now contributing to a Jobs Crisis? For sure, major innovations like Jobs' Apple II and Macintosh once created a plethora of breathtaking career opportunities, along with personal empowerment. Perhaps another such game changer might come along. But absent that, new technologies will likely extend the trend of the last ten years: creating splendid career opportunities for fewer and fewer while diminishing job opportunities for more and more. Looking forward, most advanced technologies like AI, quantum computing, and nanotech robotics are sure to put more and more professional, skilled, and semi-skilled people out of work. Their only hope might be to merge themselves with their technology, as presently being prototyped in Alzheimer's patients and military volunteers. Make way for "Homo Sapiens 2.0?" Global Democracy or Ersatz Democracy? Working as a manager at Xerox LiveWorks during the rise of the Internet, I uncritically promoted Steve Jobs' utopian vision of electronic democracy. All my fellow engineers, on the other hand, ardently insisted "Forget about it!" Computerized balloting, they warned, is 180 degrees out of phase with old-fashioned paper balloting. Why? While paper ballot processing is transparent to anyone who can count, computerized ballot processing is transparent to no one except the software proprietor. To be authentic, however, democracy requires a transparent ballot process. Since its implementation, opaque computerized elections have yielded the widest discrepancies ever between the "official count" and many exit polls—historically the most accurate predictor of who actually won the election. While technology is not inherently anti-democratic, it is not inherently democratic either; and just because we can computerize anything does not mean we must computerize everything. On the bright side of computerization, social media do represent a potential force for democratization by enabling peoples' movements across national, religious, and racial boundaries, and with a speed and facility never before thought possible. How about global consumer unions that patronize only those vendors that meet published standards of acceptance? Every time you shop, you're voting: that's effective participative democracy. In 1996, when asked what should be done about education's gradual slide into mediocrity, technology evangelist Jobs cautioned "What’s wrong with education cannot be fixed with technology...The problems are sociopolitical." And he's right. Computerized Government: Digital Deliverance or Digital Disaster? When I arrived in Silicon Valley in the mid-1980s California had a strong billion state surplus and was the ninth largest economy in the world. By 2004, after computerizing the government, the state had accumulated a $22 billion debt. Apparently, all the $billions they had put into computers, databases, servers, web applications, and middleware was not able to offset the mismanagement of state budgeting, population growth, and a rapidly globalizing (and digitizing) economy. And the feds? Well, since digitizing the entire government under Clinton and Bush, federal debt has only gotten much worse. Why? Because balanced budgeting is not so much a technical problem; it's mostly a matter of good arithmetic and basic integrity. For example, following computerization, we saw Rumsfeld report $2.3 trillion unaccounted for in Pentagon spending. Before digitized "friction-free capitalism" (Bill Gates, The Road Ahead) a loss that stupendous was not only unthinkable, it was not even technically possible! This is largely a matter of importing more than we export, or consuming more than we produce—a likely result of globalization and too much offshoring of manufacturing. SCM (supply chain management) and other high-tech e-commerce software have only greased the rails for US corporations to outsource and offshore more operations, which ultimately translates to increased imports. While the US continues to lead the world in arms and pharmaceuticals exports, our leading imports are now those things everybody needs for everyday life. Americans must either go back to manufacturing real products for everyday consumption, or shrink consumption—or both. New technology exports won't help much, since after invention and productization most of the operations are soon offshored. The US was once a world leader in manufacturing, exports, agriculture, education and trade surplus—all without iPads, laptops, social media, cell phones, high-speed computer trading, or computerized derivatives. And also without ponderous debt or a jobs crisis. Of course, only a Luddite would reject all mechanized or computerized technology. It is equally true that only an overreaching religious zealot would tenaciously hold to the credo: "Her Highness Technology Über Alles!" Even Steve Jobs backed off of that one. Technology is very good at solving many problems. Transforming human nature is not one of them. People still cheat, steal, lie, shade the truth in their favor, betray, enslave, bomb, torture, and murder—only now it's at light speed. This wanton behavior has been going on since Adam bit the apple and lost paradise. Can technology rehabilitate the human situation? While transhumanists insist "Yes", history emphatically says "No." The quandaries of post-modern—some say posthuman—civilization are not essentially technical in nature and do not fit neatly into a technical solution. The errant human condition and its predicament is essentially spiritual in nature and calls for a spiritual remedy—one ordered under a combination of proven virtues and a serious dose of transcendent Wisdom. Without this, all the science, technology and bitten apples in the whole universe are more likely to lead us to Kidron Valley than back to Eden. Submitted by OracleWoman on Thu, 04/25/2013 - 23:18. Your attention on "In China, they're even replacing—note "replacing," not helping—waiters with robots" is significant and timely. Did you see Oblivion--just out last weekend? It's a major theme of the film and the future they conceived of is quite disturbing. Much of what you've written has manifested. I journaled all the ideas from Oblivion. Just before seeing this film, I viewed Minority Report again and had journaled ideas from that film. It was like watching an extension of the Minority Report ideas--ideas that you captured in your link above on "human-computer interfaces". I think one of the answers is for us to spiritualize our lives and create a new renaissance, a landscape of person-to-person exchanges of all that we need for fulfilling lives. Retract somehow while participating fully at the same time. How high you hang the TV? Submitted by Edgardcvnk on Sat, 04/13/2013 - 21:19.
on our official website matched the huge range of interesting articles about volkswagen t5.